Looking for a Classic Stuffing Recipe? My version is made with day old bread, vegetables, apples and mushrooms! 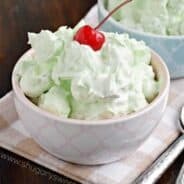 Easy to make ahead of time too! As I was putting my 5th load of laundry in the washing machine for the day, it occurred to me we as a generation of Americans are so spoiled. We have no right to complain about laundry, dinner, or even clothes shopping for that matter. I was thinking about this and how my ancestors had to wash all their clothes by hand. And how dinner was about making bread from scratch to go with their meat and vegetables. Sometimes I wonder if it was easier times? Not worrying about the cost of all our “stuff.” You know, the things that give us convenience in life…washing machines, cars, store bought food! But then I realized, I can’t even sew a button on a shirt, I’m thankful for Target, haha!! As Thanksgiving is approaching, I am trying to be more grateful and thankful for the good things in my life. It’s so easy to take even the littlest things for granted. Including store bought bread and Crunch Pak sliced apples, haha. Because it definitely makes this Classic Stuffing Recipe a cinch to assemble! 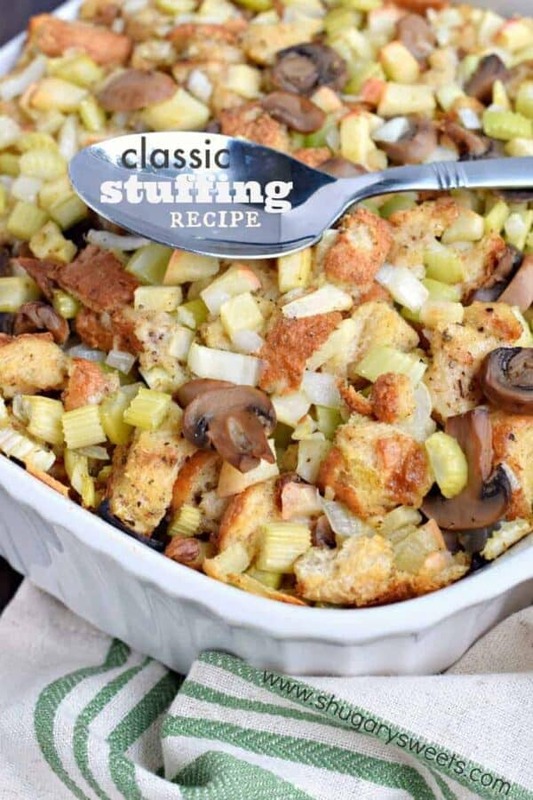 Speaking of stuffing….do you call it stuffing or dressing where you are from? And do you put yours IN the bird? I personally prefer it out of the bird, in a casserole dish, ha! Today’s recipe for stuffing is from my grandma. My blog is my place to share family recipes, not only for you all (my readers) but also for my family (and myself). Instead of a box of recipe cards, I use my blog to keep my recipes in order. I love my stuffing full of all the crunchy stuff (probably even more than grandma uses). 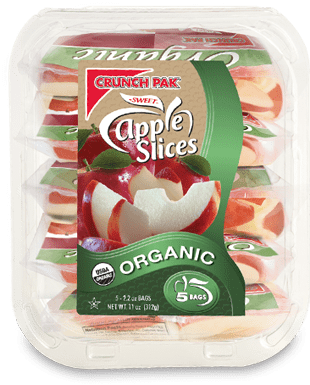 I used Crunch Pak apple slices for a quick shortcut in this recipe. No need to slice or peel those apples, just give them a couple chops into small pieces. Purchase whichever flavor you wish, they will all work wonderfully! So…what else is on your Thanksgiving menu? Here are a few of my favorite Thanksgiving recipes: ENJOY! 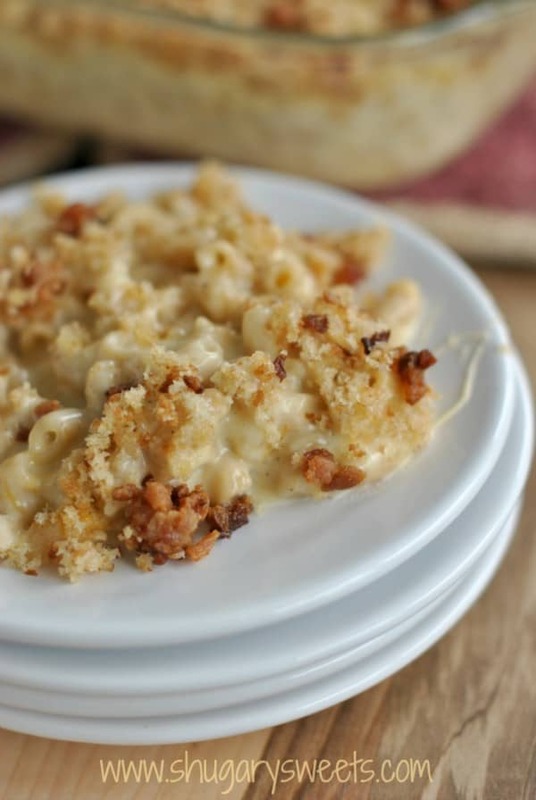 Gouda Bacon Macaroni and Cheese: our favorite mac and cheese that pleases kids and adults! 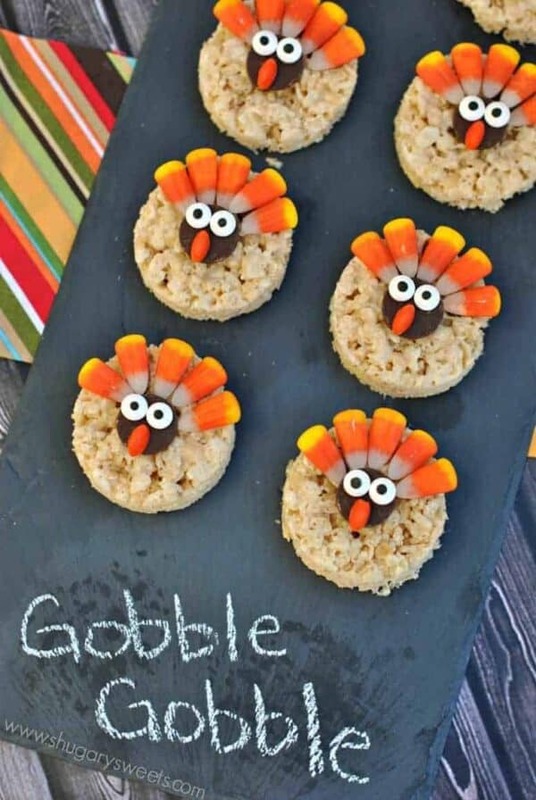 Turkey Krispie Treats: these fun treats are easy enough for the kids to help make! 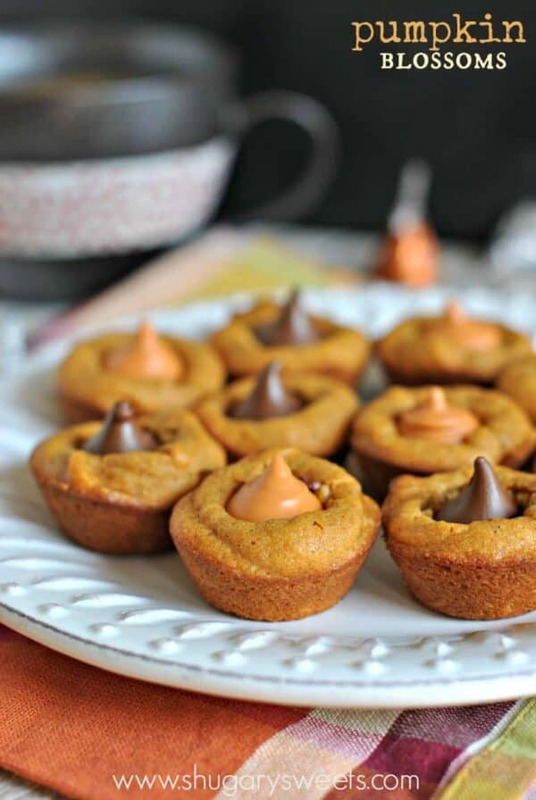 Pumpkin Blossoms: these are a must have on your dessert table! 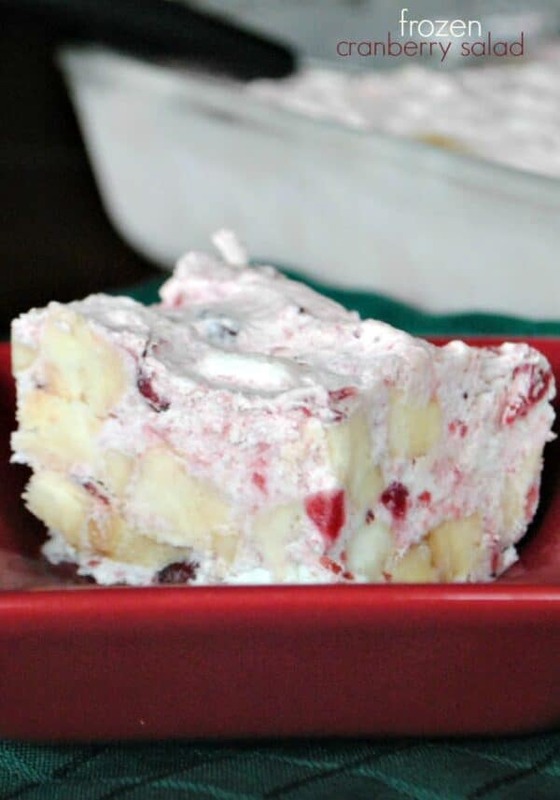 Frozen Cranberry Fluff: our traditional cranberry salad every year. And bonus: it can be made DAYS ahead of time! 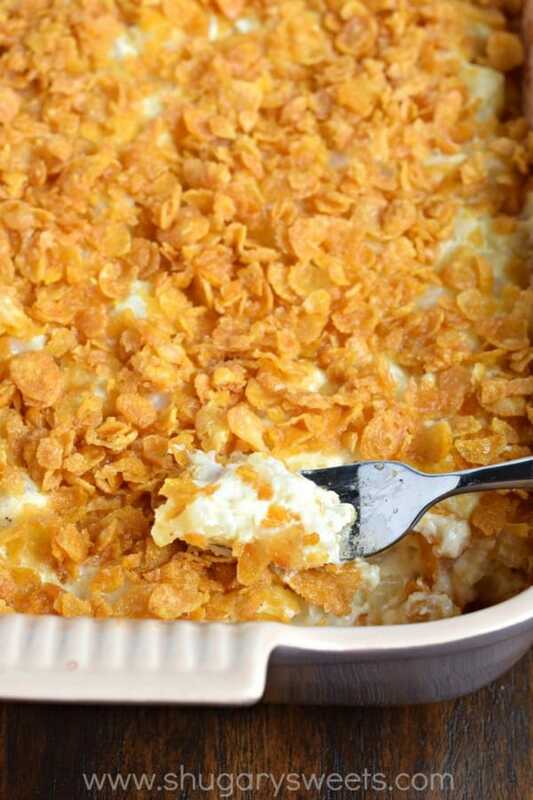 This Cheesy Hashbrown Casserole recipe (funeral potatoes) is true comfort food. Made with frozen hash browns and plenty of cheese, I can guarantee your family is going to enjoy this one! 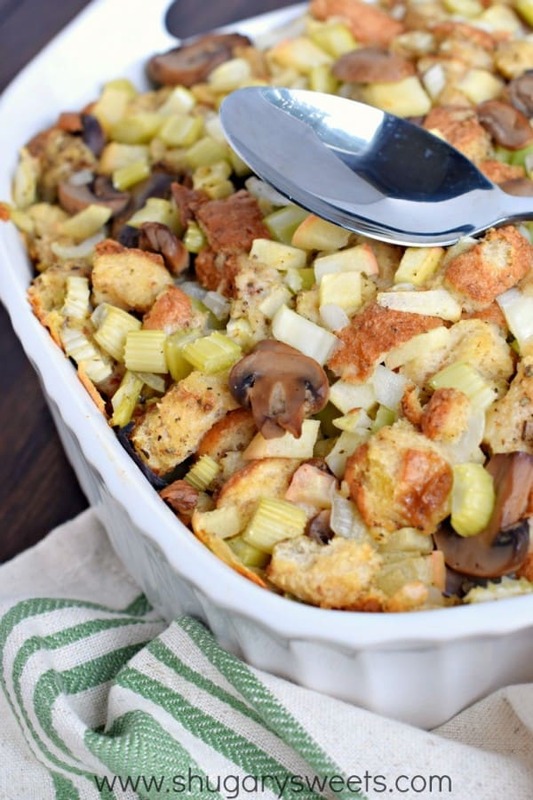 You'll love this Classic Stuffing recipe packed with flavor and perfect for Thanksgiving! In a large mixing bowl, combine stale bread with egg, water, celery, onion, mushrooms, and seasonings. Combine well. Press into a 9-inch square baking dish (about 2-3 quart). Once you have all your stuffing in the dish, press it in firmly. Cover stuffing with foil. Bake for 60 minutes in a 350 degree F oven. You can make this a day ahead of time too! ENJOY. For the bread, white or wheat is fine. I like to take my bread and let it sit open on the counter overnight, making it a little stale. Too fresh of bread will get soft and soggy. This looks a lot like my stuffing, which means I’m now officially hungry and ready for this holiday to happen! I love using an eggy bread (like challah) because it gets so rich and amazing. I’ve never used apples, though, and I’m totally adding them this year. Thanks for inspiring, Aimee! Yes – so agree…definitely thankful for Target! Classic stuffing is basically all I eat at Thanksgiving. I can’t get enough of its carby deliciousness! Yours looks perfect and i was so nice seeing you this weekend! Pinned! The stuffing is the best part of the meal for me. Then bring on the pie and sweets LOL! It is easy to take everything we have for granted. We have so many things to be thankful for every day!!! 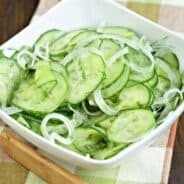 We are big Crunch Pak fans – I’m thankful for them in my kids lunchboxes! 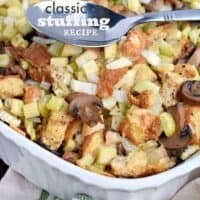 🙂 Really loving the sweet and savory you have going on in this stuffing! Looks delicious! Perfection! My sister and I have decided to do a sibling thanksgiving this year out west since out parents are in Kentucky instead of heading our separate ways to our inlaws. That means we now have to figure out how to make everything!! Stuffing was one of those things we had neither ever made. I can’t wait to give this a try! I LOVE how easy this is to throw together! And also? I could eat ONLY stuffing o nThanksgiving and be a happy girl. Okay, not really, but I do really love me some stuffing. This looks amazing, Amy! Recipes from grandmas are the best! The stuffing IS my favorite part of the meal..covered in gravy of course! This sounds incredibly delicious! Stuffing is often the best part of Thanksgiving dinner! We are so spoiled! No need to cut our own apples or shred our own cheese … I love it! LOL. I love CrunchPak because I can give my daughter a healthy snack with zero effort! I love using shortcuts to make prep easier, especially on big holidays! 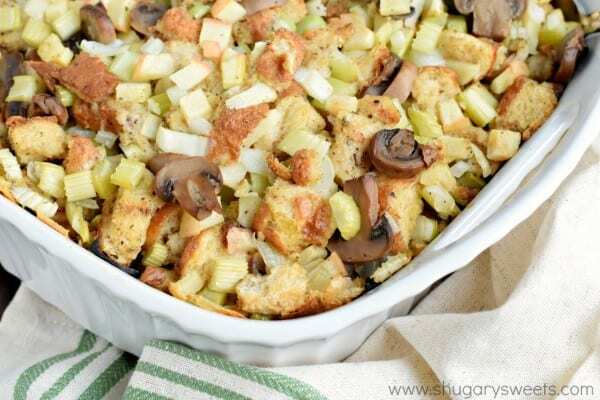 This is a delicious looking stuffing, I can’t wait to try it out! Looks so flavorful and delicious! Will make this for Thanksgiving!! The only stuffing for our family is cornbread stuffing. Basically made the same way but using crumbled up cornbread and a half loaf of heavy white bread. I alos use fresh mushrooms.